Before we go on to looking at some math regarding 2-variable linear equations (or lines), we must first become familiar with some important terms that applies to all sorts of 2D equations. Definition: The Origin in $2$-dimensional space is the point in which the $x$-axis and the $y$-axis intersect, and has coordinates $(0, 0)$. 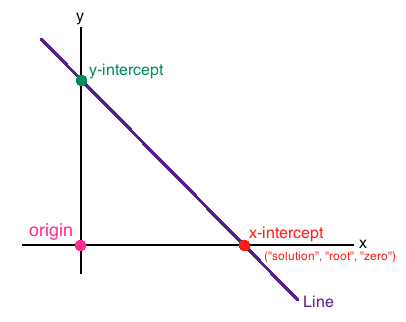 Definition A line is said to have an $x$-Interception, Root, or Solution at all points where the line intersects the $x$-axis. 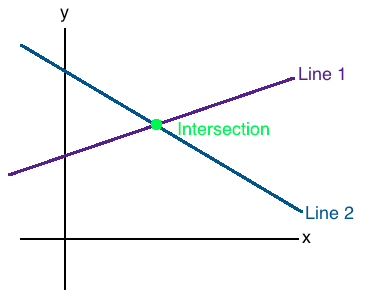 Similarly, a line is said to have a $y$-Interception at all points where the line intersects the $y$-axis. More generally, any curve that passes through the $x$-axis is said to have an $x$-interception at that point. Similarly, any curve that passes through the $y$-axis is said to have a $y$-interception at that point. Definition: Two lines are said to Intersect if they cross each other.